The other day we told you about a planned protest of immigration policy to be held at Casa de Maryland in Silver Spring on Saturday. I found about sixty anti-immigrant (read anti-Hispanic) web sites that were broadcasting the Help Save Maryland announcement of the protest. Casa de Maryland encouraged those who were sympathetic to the plight of immigrants to come show their support in a gentle way, helping out with phone calls and gardening. You might say that the event did not register on the news. If you can find any story about it, please email us here or paste the link into the comments for this post, because it seems that not a ripple was generated by the great throngs of Nutty Ones who congregated to take their country back et cetera. The CASA staff and illegal alien Day Laborers never knew what hit them today. 100 Help Save Maryland members and supporters arrived at the Silver Spring Day Laborer Center, bringing the lawless worker operation to a complete halt. There were plenty of signs, flags and voices letting the CASA center and those driving by that HSM members are opposed to wasting tax dollars on illegal worker centers for illegal aliens. Instead of furloughing Montgomery County Police officers and Firemen, this taxpayer funded illegal worker center should be shut down instead. Concerned citizens participated from 10 Maryland Counties – Anne Arundel, Baltimore City, Baltimore County, Carroll, Cecil, Harford, Howard, Montgomery, Prince George’s and Washington. Our friends from the Cecil County Patriots drive 2 hours to support HSM! Readers: if anyone can find anything on WUSA TV 9's web site, suggesting that they ran any story about this demonstration at all, again, please email us or paste a link into a comment and I will update this post. As of now, it appears that the blogger for U.S. Constitutional Free Press may have been hallucinating. Or lying. The USCFP post seems to have been written by the Director of Help Save Maryland, but I don't find the text on their web site. That same blog published photos from the demonstration HERE. Go look if you don't believe me, but this is the photograph that shows the hugest crowd. I see nine people, plus some standing around on the other side of the fence, which I assume to be the Casa de Maryland side. Overwhelmed with "100 Help Save Maryland members and supporters" from ten Maryland counties, eh? So that's the protesters' side of the story. Casa de Maryland put out a press release describing the event, too. (Silver Spring, MD) Several dozen anti-immigrant and pro-Arizona militants who blocked sidewalks on busy University Boulevard in East Silver Spring today were greeted by more than 70 volunteers who came to the site to plant flowers. The protest was organized by Help Save Maryland, a group that has been declared a nativist/extremist organization by the Southern Poverty Law Center, an organization whose history has been spent combating the Klu Klux Klan and other hate groups. The several dozen immigration opponents levied signs, shouted through megaphones, and on several occasions hurtled racist epitaphs and yelled and cursed at small children. Rather than organize a counter-protest, CASA invited community members, civic association and church activists, and others to spend several hours at the same site planting flowers and sharing stories. The seventy-four volunteers included a Methodist reverend, local residents, and political leaders. Describing why they wanted to participate, many described their frustration with the unfolding human rights drama in the State of Arizona and make a statement that Maryland will not follow suit. Every country needs to have clear immigration policies and has the right to enforce them. If you have a view of what the policy should be in our country, I would suggest you contact your representatives in Congress and tell them what you want. 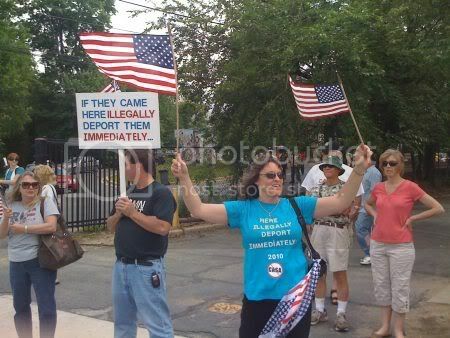 It doesn't make any sense to stand outside Casa de Maryland with bullhorns, waving American flags and signs that say "Immigrants are Lying Thieves," as shown proudly on the blog I just linked. That is simply racism, it is not an opinion that addresses federal immigration policy or its enforcement, it is a mean-hearted and false generalization about a group of people. As you might expect, I'm buying Casa's version of the event. The right thing to do is to fight hate with love. Aprenda un poco español, learn to talk with your new neighbors. It's hard moving far from your home, and I think the American way would be to make people feel welcome, not call them lying thieves and try to deport them. The federal government must establish and enforce fair policies, but this is a horse that's already out of the barn, US immigration is confused and disorganized, and we need to deal with the situation as it is, fairly and kindly. NPR had a great piece today on Tell Me More talking about how we need to think about the children in mixed documented homes. It´s kind of heartless to continue on a rant against immigration when an innocent child speaks. I recommend listening to the piece. HOW ABOUT WHEN AN INNOCENT CHILD IS SUBJECTED TO HOMOSEXUAL PARENTS? Anon, we were talking about immigration here, but if you want to change the subject, maybe somebody will bite. Are you asking about any issues regarding children with gay parents? Not clear what the term "subjected to" is supposed to mean -- in English we typically say a child "has" parents, not that they are "subjected to" them. Whoa...I knew I spoke too soon when I asked where the dopey and bigoted "Anonymous" posters were. Homophobia is a sickness! How about when an innocent gay child is living with homophobic parents? Someone needs to fix his 'caps lock' button. frankly,i want to leave the us.and,yes a lot of it is the mexican problem. no one gave the american indian any amnesty when the europeans stole our lands.it was okay to kill all of them.now hoards of illegals have invaded our land and expect amnesty and a life given to them. go back home. work to improve your lot in your native country.don't ask us to give you eveything your heart desires.